Detached single storey house, modern in quiet area. Property 17: Detached single storey house, modern in quiet area. This romantic cottage with private garden on a hilltop is ideal for couples! Property 28: This romantic cottage with private garden on a hilltop is ideal for couples! 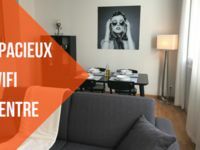 Gîte "In the meadow of Albi"
Property 48: Gîte "In the meadow of Albi"
We thoroughly enjoyed our recent stay in Albi and this apartment was perfect. The managers gave us great advice for restaurants and shopping, all within walking distance. The apartment was clean, warm, nicely decorated, well organized, and parking was very convenient. We hope to go back! We spent 4 nights in Xavier-Marie's apartment and had a wonderful time. The apartment had everything we needed for a short stay and he was most gracious in meeting us and giving us instructions about the apartment. He also made some great suggestions about what to do and see while in Albi. If we come back, we will definitely stay here again!